After a regular school board meeting Nov. 19, the Sartell-St. Stephen board members met in a working meeting to grapple with several questions related to the recent defeated operations levy: what happens now, where do we go from here and why did the levy fail. The next chance to try again to pass an operational levy will be in November 2019, according to Director of Business Services Joe Prom. If it passed, it would not take effect until the fiscal 2020-2021 budget year. That means there will have to be belt-tightening for the foreseeable future. Prom also reminded the board this is a funding year for the state legislature, and how much or little they will appropriate is still a question mark until early June at the earliest. Hopefully, the legislature will be generous, but even that generosity would be later than needed. Budget adjustments will have to be made sooner than that. The February board meeting is when Prom said he would like to talk about some administrative targets and some general numbers without being specific as to what budget areas will be reduced. Specific reductions would be presented later throughout March and April to the board and stakeholders. One immediate suggestion was to incentivize some of the senior staff members to retire or leave their position thus giving the district cost savings by hiring younger less-costly employees. It would take the form of a severance bonus. The bonus would only be offered this year, and the district would need to know by February if someone were applying for the bonus. The question of why the levy failed and how to proceed in the next try for levy passage occupied a major portion of the meeting. The last time a levy failed was 2001 under the then Superintendent Kay Worner. Superintendent Jeff Schwiebert suggested the board embark on a series of listening sessions with members of the community. He suggested several areas in the district where sessions could be scheduled including St. Stephen, Blackberry Ridge, Liquid Assets and the Community Center. Board member Mary McCabe asked whether the vote had been analyzed as to where the most resistance to the levy might have come from. “We did not have a majority in any of the 11 precincts,” Schwiebert said. Schwiebert added there seemed to be a stronger negative reaction in the northern part of the district according to the data. Going back to why the levy failed, Schwiebert said he felt the community had lost some trust in the board. Board member Pam Raden echoed the idea that it probably was a good idea to hold the listening sessions. “I really would like to hear what they have to say – I’m sure there was some confusion,” Raden said. McCabe added that in the listening sessions, the board needed to have some of the facts available to them because there were some people who did not remember there had been discussions about coming back for the operational levy. A fair number claimed they hadn’t been told the board would be coming back to ask for money to operate the schools, McCabe said. Schwiebert then suggested the board start to put together a committee similar to the community planning committee to help sell the message of the need for increased operational funding to run the schools. We need to educate more people about the levy and this is one of the best ways to do it, Schwiebert said. Schwiebert went on to say it might be a good idea to recruit at least two persons from each precinct who would be willing to educate themselves and then carry the message to neighbors in their precinct. He suggested Prom be enlisted to teach members of the committee about school finance and budgeting. McCabe was not entirely convinced that people didn’t trust what the district was trying to do. From her perspective, it was more a matter of people not understanding what was really needed. Raden added she thought the staff needed to be more a part of the drive. We need to get the staff on board and understanding this, she said. 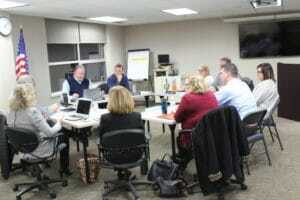 Members of the Sartell-St.Stephen school district met Nov. 19 for a working session to consider what to do now the operational levy has been defeated.